Prepare wild rice mix according to package directions. Place oil in a medium skillet and heat until hot. Sauté apples, celery and onions for 3 minutes, or until vegetables are tender. Stir in raisins and almonds; cook 1 minute more. Remove from heat. 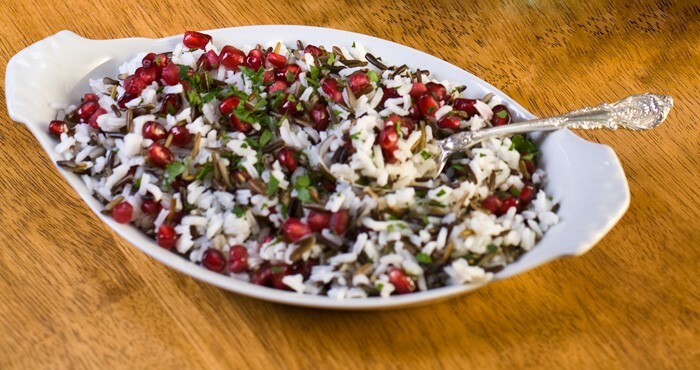 When rice is done, stir in sautéed mixture and the pomegranate juice over low heat for 2-3 minutes. Remove from heat and add pomegranate seeds. This entry was posted in Dairy Free, Recipes, Side Dishes. Bookmark the permalink.